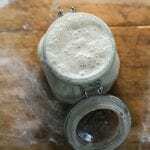 Looking for an easy, sourdough starter recipe for beginners? Adapted from Artisan Sourdough Made Simple, follow my no-nonsense guide for practical tips, tricks, and ongoing care- anyone can do it. For best results, it’s always a good thing to weigh your ingredients in baking. However, when creating a starter, using measuring cups is fine. Only a small amount of whole wheat flour is used to jumpstart the fermentation process. You can find smaller bags in most grocery stores if you don’t want to commit to the larger 5lb bag. You will also need one large 3/4 L jar, or something of similar size (I use this one.). Combine 60 g (1⁄2 cup) of whole wheat flour and 60 g (1⁄4 cup) of water in a large jar. Mix with a fork until smooth; the consistency will be thick and pasty. If measuring by volume, add more water to thin out the texture. Cover loosely with plastic wrap or a small cloth, and let it rest in a warm spot, about 75-80 F, for 24 hours. *Tip: Looking for a warm spot? Place your starter on a cookie sheet inside the oven (turned off) with the light on. You can also use a proofing box set to your desired temperature, or a microwave with the door ajar and light on. Check to see if any bubbles have appeared on the surface. If you don’t see anything, it’s okay. The bubbles might have appeared and dissolved overnight while you were sleeping. You don’t have to do anything else now. Rest the starter in your warm spot for another 24 hours. Remove and discard approximately half of your starter from the jar. The texture will be very stretchy. Add 30 g (1⁄4 cup) of all-purpose our and 30 g (2 tbsp) of water to the jar. Mix with a fork until smooth. The texture should resemble thick-ish batter or plain Stonyfield yogurt at this point, so add more water as needed. Cover loosely, and let rest in your warm spot for another 24 hours. *Tip: During the creation process, and even after your starter has been established, a dark liquid might appear on the surface and throughout the culture. It has a very stinky smell, similar to rubbing alcohol or gym socks. This liquid is called “hooch” and is an indication that your starter needs to be fed. Any time you see this liquid, it’s best to remove it along with any discolored starter present. Days 4, 5 & 6: Keep on Feeding! Repeat the feeding process outlined on Day 3 (remove and discard half of the starter, and feed it with 30 g (1⁄4 cup) of all-purpose our and 30 g (2 tbsp) of water.) As the yeast begins to develop, your starter will rise, and bubbles will form on the surface and throughout the culture. When the starter falls, it’s time to feed it again. *Tip: Place a rubber band or piece of masking tape around the jar to measure the starter’s growth as it rises. Day 7: A Sourdough Starter is Born! By now, your starter should have doubled in size. You should see plenty of bubbles, both large and small. The texture will be spongy, fluffy, and similar to roasted marshmallows (think: s’mores). It should smell pleasant, and not link stinky like gym socks. If these conditions are met, your starter is now active and ready to use! Please keep in mind, if your starter is not ready at this point which is quite common due to temperature issues (too cold), timing, and other factors, continue the feeding process for 1-2 weeks or more. Be patient! *Tip: Wondering if your starter is ready to use? Do the float test. Drop a teaspoon of bubbly starter in a jar of water; if it floats to the top you can use it. The very last step is to transfer your starter to a nice, clean jar. In keeping with tradition, you can also name it- and please do! My starter is called Dillon, after my oldest boy. If you bake often, store your starter at room temperature (feed it 1x-2x a day to keep it active). If you plan to bake only once in a while, store it in the fridge to preserve its strength (feed it 1x a week). Begin by removing and discarding about half of your starter. Replenish what’s left in the jar with fresh flour (use all purpose flour) and water. Cover loosely, and let it rise at room temperature until bubbly and double in size. Once it falls, the bubbles will become frothy and eventually disappear. Then you’ll know it’s time to feed your starter again. Feed your starter everyday (1x-2x) if it’s stored at room temperature. Feed it 1x a week if you keep it in the fridge. PS: If you miss a feeding, don’t worry- your starter is not going to die. It might look ugly (and smell horrendous) but it usually just needs a few feedings to perk back up.